photo credit: Heritage Seedlings and Liners Inc.
As a shade gardener, you are always on the hunt for plants to add color and brightness to your shade garden. The new fairy-bell cultivar Disporum longistylum ‘Night Heron’ does just that. 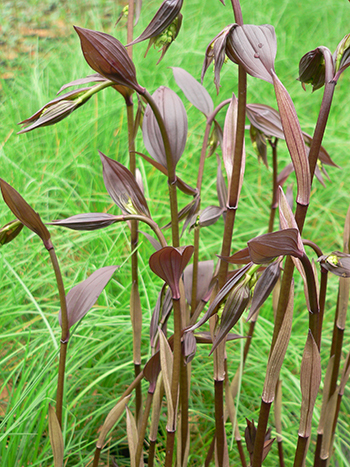 This Disporum cultivar is known for its elegant chocolate-brown spring shoots which contrast wonderfully with its greenish bell-shaped flowers. The flowers are followed by berries, which ripen to a purple-black in fall. 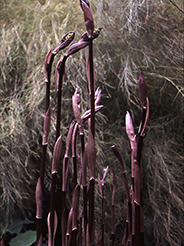 The dark color is most prominent in late spring, and the plant matures to a pleasing greenish-purple color. This colored foliage makes a great contrast to the greens in your shade garden through the growing season. This low-maintenance herbaceous perennial reaches 4-6’ tall and 2’ wide at maturity. D. longistylum ‘Night Heron’ grows best in shade to part sun in moist but well-drained soil. If allowed to naturalize, it will slowly spread over time, but is not considered invasive. In fact, with its tall stems and narrow leaves, it resembles bamboo but with much lower risk of spreading aggressively. It is hardy to zones 5-10, and can be semi-evergreen to evergreen in zones 7-10. This great plant is a 2018 spring dividend for Scott Arboretum members. (A second option, Plump and Plentiful TM Purple Giant Beautyberry, Callicarpa ’05-132’, is also available for members with a more sunny garden.) Members can pick up their plant at the Scott Arboretum Selections: Spring Sale. Join today to get this great plant for your shade garden today. I have never heard of this plant before, it looks quite stunning, will have to seek it out.